I own a Coachman 23-1/2 foot 5th wheel. The RV battery does not take a charge while the unit is plugged in, however it does charge while I am hooked up to my tow vehicle. I have checked all the fuses and wiring that I can trace with no problems found. Sounds like it's time to check the converter/charger in your RV, Alexander. The AC side of the converter is either plugged into a receptacle or is wired directly to the 120-volt AC system, always through a circuit breaker. 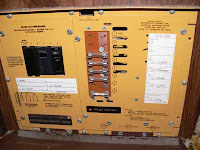 Check the circuit for the converter and be sure that breaker is not tripped. If the breaker is fine, then the problem may be interior to the converter. Most converters utilize an internal relay that switches to converter power when plugged in and switches back to battery power when disconnected from the shoreline. Relays can become stuck or burned over time and not switch from one source to the other, thereby creating an open in the battery circuit. Another possibility is a blown fuse in the battery charge circuit itself. A fuse could be situated in the converter or in-line near the battery. Check each of these possibilities. Chances are it will be one of them. If all else fails, send me the make and model of that converter and we’ll dig a little deeper.